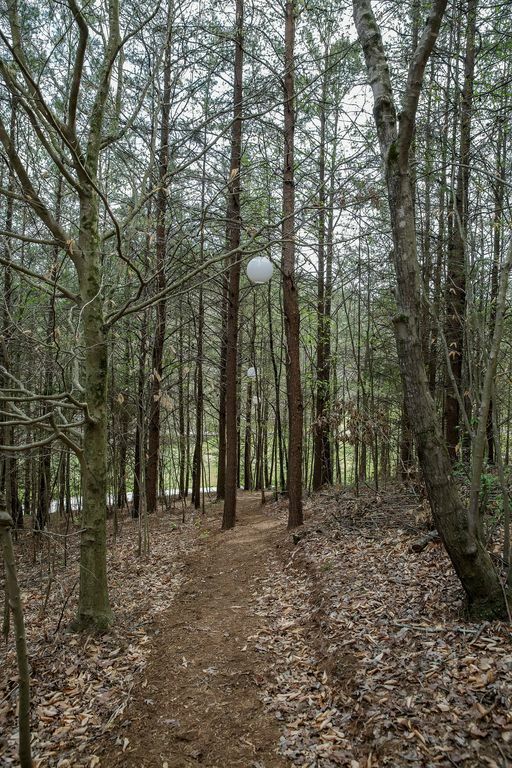 Sophie's Roost is a charming and beautifully decorated treehouse nestled on the side of Early Moon Ridge at The Candlelight Forest in Chickamauga . Only 20 minutes from downtown Chattanooga, by way of a pastoral drive through the Chattanooga Valley, these accommodations are perfectly located to take in Chattanooga and the many surrounding attractions that abound nearby, including Cloudland Canyon State Park, Rock City, Ruby Falls, and The Chickamauga National Battlefield Park. Perched in a beautiful canopy, Sophie's Roost is built on a sloping ridge and provides for very safe and easy access, as its entrance is at ground level. Tamara Dillard, the owner of Sophie's, a home decor shop located in the North Shore district of Chattanooga, along with her staff professionally decorated Sophie's Roost, hence its name. A private queen bed nook, an open living area, a full bath, a back porch, any many thoughtful nooks and crannies adorned with decorator surprises, provide the downstairs living experience. Up a two-tiered loft ladder, 4 twin beds and a cute half bath await the more adventurous up above. Our own signature Canopy Kitchenette (TM) rounds out the experience. The back porch has a very simple kitchen that includes a stainless wash sink, concrete countertop, toaster, and a gas grill with side burner, all elegantly covered in the shade of an oversized umbrella. Dine upon the custom built-in fold-down table and antique wooden chairs. Sophie's Roost combines the greatest of all vacation experiences - cooking outdoors with shelter to boot, cozy spaces for family fun and romance, and a home base for all the excitement that awaits in this enchanting mountain and valley world only minutes from vibrant Chattanooga. Our Canopy Kitchenette (TM) provides a fun outdoor cooking experience on the back porch. Complete with a sink, countertop, granite prep surface, toaster, and gas grill with a side burner. It was a great overall experience! Would recommend to anyone looking for something different. Keep in mind it’s a short walk through woods from car parking and no TV. So pack lightly and relax. This is a place to stay for the experience. For us it was the perfect place to spend a night while visiting Chattanooga with our kids. They probably enjoyed the treehouse as much as anything else. They loved the idea of sleeping in a treehouse and the bunks upstairs gave them a secret hideout. The layout is small but well thought out to make the most efficient use of space and decor was very nicely done. Unlimited hot water is a plus. Loved the accommodations and the property! What a find near Chattanooga! High quality finishes and decor. Loved the outdoor kitchen. While cooking outdoors may have taken longer than usual, the experience was fun for all and it was well appointed with cooking gadgets and tableware. Kids also loved all the outdoor activities from the treehouse to the games to the canoe. Will recommend to others! The charm of a treehouse with the comforts of home!! Great experience! The surrounding area is beautiful. We took our kids 11, 8, and 5 and they loved it! They especially loved the swings and ponds. We truly did things together like skipping rocks, hiking, climbing trees. . . things kids should do! And then in the treehouse we played cards and board games. We were able to cook breakfast in the outdoor kitchen and eat sandwiches for lunch. We drove into Chattanooga (straight shot, easy drive ab 12 miles) to eat dinner. The beds are comfortable and the treehouse is so cozy. We can't wait to return!! We really enjoyed our stay in the treehouse! Our little ones loved the loft and the time we spent exploring outside. Be sure to visit the play treehouse, rope swing, and lake nearby! It was also an easy drive into Chattanooga, where we spent a lot of our time. It truly was a great place to stay, with the privacy and unique experience we were looking for! We hope to go back.